Eight top FFA members were honored as Academic All Staters by the Oklahoma Youth Expo on Thursday evening, The Acadmeic All State Program is designed to model athletic all state programs in which a select few are recognized for their outstanding achievement and dedication to success. Each of the eight Academic All State members were awarded a $5,000 educational scholarship. Ranked first among the eight All State Winners was Tyler Schnaithman of the Garber FFA. Just in advance of the ceremony on Thursday evening- we talked with Tyler for a few moments- and you can hear that conversation by clicking on the LISTEN BAR below. The top four All State Winners were awarded the Express Ranches Educational Scholarship. The other $5,000 scholarships were provided by Byford Buick GMC in Chickasha, Oklahoma State University and the Oklahoma Youth Expo- this scholarship was presented in honor of Justin Whitefield- former Executive Director of the OYE. 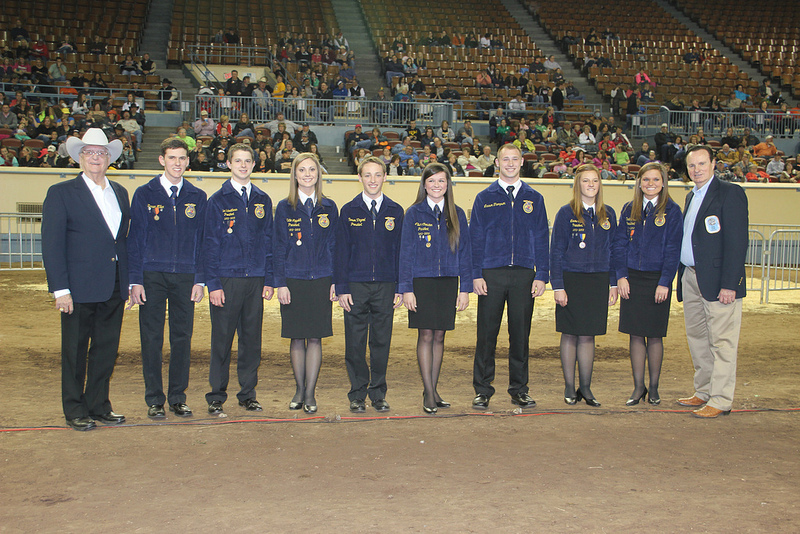 To see more pictures of the Scholarship award winners- as well as all of the other photos we have taken to this point at the 2013 OYE, click here for our set of OYE pics on FLICKR.